All wedding and engagemnt photos taken by wedding photography wizard, Courtney Smith Photography. When Justin and I first got engaged, I was pretty surprised how often people were quick to ask me “Where are you registered? !” While I had long dreamed of our wedding (read more about our wedding here and here), the thought of wedding gifts had never even crossed my mind. Since I have lived on my own since I was fourteen years old, and with Justin for the preceding four years, we had all of our bare-minimum housing accoutrements needs met. So registering for something like a luggage scale or spiralizer seemed so out of the realm of my everyday possibility that I couldn’t really fathom the idea of registering at Crate & Barrel or Bed Bath & Beyond. So what’s a bride/groom-to-be to do? Enter the earth-shattering awesomeness that is a honeymoon fund. What is a honeymoon fund? A honeymoon fund is a website where you can register for various experiences on your honeymoon, from a dinner on a catamaran, to a couples’ massage. Instead of your guests buying you a toaster oven, they can buy you a rain forest hiking excursion. Essentially, guests can partially or fully fund any of your honeymoon experiences in lieu of a traditional wedding gift. But what is a honeymoon fund really? Okay, okay, truth be told, a honeymoon fund site is basically like a classy and somewhat roundabout way of asking for money for your honeymoon (maybe even verging on being analogous with a GoFundMe site?). While you register for specific items or experiences, these items are not purchased through the website, but instead, money your guests use to fund your registry is transferred to your bank account, where you can then use it to purchase airfare, that new fancy tent, whatever your wanderlusty heart desires. 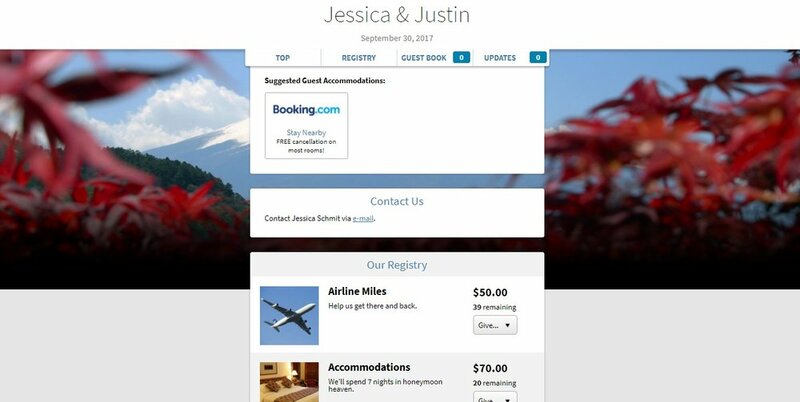 This nuance is why some people still take issue with honeymoon registries- there were a couple of people who second guessed our decision to exclusively use a honeymoon funding site (“But where are you really registered?”), but honestly, if you think the idea of a honeymoon fund is “tacky”, the whole concept of a registry, a specific catalog of items you are asking others to buy you at their election, is equally just as tacky. I’ve had countless friends get married and tell me about their misadventures returning various unwanted or duplicate wedding gifts, unanimously indicating that they would have much preferred cash over these unwanted presents. Why go through the weird (not to mention the wasted time, money, and energy) transactional charade of pretending to appreciate the andirons Aunt Mildred bought you, if you can get an awesome honeymoon experience you 100% know you will enjoy? And you know what’s unarguably more uncomfortable than your grandparents asking you to explain the concept of a honeymoon fund? Scrambling to find and put out the monogrammed hand towels they bought you before they come over for Thanksgiving every year. Fortunately, there is no expectation of you displaying your snorkeling excursion in Bali on your mantle every time Cousin Betty rolls into town. That being said, traditional registries absolutely have their time and place, but with more couples living together before marriage and waiting until their late twenties into their thirties to tie the knot, there is less of a compelling need for couples to celebrate their eternal love with rice cookers, vacuums, and serving dishes. So, if you, like us, find yourself in the fortunate position of having all of life’s necessary accessories, a honeymoon registry may be a great option for you. You can also have both a honeymoon and traditional registry, with as few or as many gift options on either registry as you deem appropriate. You do some research and determine which site is right for you (more on that below). You create an account on your site of choice, fill out some information about you, your fiance and the honeymoon, and voila, you’re ready to start adding things to your registry, which range from pre-specified gifts from affiliate vendors of the site (i.e. a certain type of excursion on whatever cruise ship you’re going on or a night at some all-inclusive resort) to custom experiences where you populate everything from the price to the location. Your guests choose which experience they want to fund and after the site takes its predetermined cut (more on that below), you are able to transfer the money directly into your bank account and then can make your necessary purchases with your swanky new gift money (my recommendation? Put all of your trip costs on your favorite travel rewards credit card o’ choice and immediately pay off the balance with the gift funds. Leave no travel points behind!). There are a myriad of articles out there that break down the pros and cons of the most popular honeymoon sites, which largely come down to user interface, registry flexibility, and associated transaction fees. I think this one, this one and this one are the most helpful articles discussing the benefits and drawback of the various options. For us, it ultimately came down between the two sites with the lowest fees, Honeyfund and Wanderable, as most of the other available options have fees ranging from seven all the way up to a whopping ten percent of whatever gift your guests give you. Honeyfund and Wanderable both have options that allow your guests to fund a particular experience, at no cost to them via cash or check or a smaller transaction fee for using a debit or credit card (2.8% + $.30 per transaction for Honeyfund, vis a vis its reliance on PayPal or, for Wanderable, 2.5% processing fee + 2.5% “registry” fee for any custom non-affiliate items added to your registry). Since we don’t live in the Stone Age anymore, I think it’s a pretty safe assumption that almost all guests will probably rely on electronic forms of payment and thus, these transaction fees will apply to almost every single gift. Since Japan is a somewhat atypical honeymoon, neither site had affiliate preloaded experiences to add to our registry, meaning, if we went with Wanderable, we would be charged the steeper 5% transaction fee. Normally, Cheapskate Jessica would have none of that and automatically go with Honeyfund, the site with the lowest transaction fees. But I didn’t! Why not? 1. The most significant portion of our decision to go with Wanderable is the ability for guests to partially fund a particular experience. Many people’s complaints with honeymoon funds is that people have less flexibility to give within their budget- for example, if all honeymoon experiences are $50 and up, a guest is essentially forced to spend at least $50 if they want to purchase something off your registry. While you can break up large purchases into smaller gifts, thereby maximizing guests’ flexibility, this really isn’t the most functional option- imagine our airfare to Japan, which cost around $1800, broken down into $20 increments to make it more manageable for guests. We would have had to create 90 different registry items for this and create a more confusing, crowded user interface and ultimately, a less pleasant experience for using our registry. With Wanderable, a guest can partially fund a particular experience to whatever pricepoint they feel comfortable with- so we listed our airplane tickets as one registry item, which was collectively funded by about 20 or so guests. This is AWESOME because it allows your guests maximum flexibility; our guests gave us gifts ranging from $15 up through $500 and this payment model allows guests to complete discretion for what they want to give you. On the same token, this allows a guest the flexibility to partially fund multiple experiences they want to invest in- several guests had the sweet idea of concocting a “date night” for us on our honeymoon (for example, contributing $15 for a tour of a Zen garden, $50 for dinner overlooking said Zen garden, and $20 for dessert and hot sake at a nearby restaurant). While the registrant winds up with the same amount of cash gift regardless of what opportunities your guests fund, it’s definitely a personal and sweet way for your guests to feel engaged with your honeymoon. 2. In a similar vein to Number 1 referenced above, Wanderable allows the person creating the registry a lot of flexibility. The account holder can determine which party is charged which fee (i.e. does the guest or registrant pay the 2.5% transaction fee? What about the 2.5% registry fee? ), which was not the case with all honeymoon registries. Since I didn’t want our guests being charged a fee for giving us gifts, I elected to take the fees out of our payout. While Honeyfund only charges the account holder a transaction fee to transfer money into an account, there is no flexibility in terms of which party pays this fee (I’m sure there is some couples out there that would elect to have their guests pay this fee). Ultimately, I think having choices in this arena is absolutely paramount and Wanderable checked that box for me. 3. Honeyfund has cheaper fees, but the user interface also looks cheaper. Unless you pay around $40 to upgrade your account to a premium version, your registry items will only have stock images associated with it. Imagine your guests logging on to your registry with just a wall of text giving options for them to purchase you and your fiance a “Glowworm Cave Tour”; “Kayaking with Dolphins Tour”; and “Visit to Hobbiton” (... can you tell I’m obsessed with going to New Zealand? ); without the appropriate images to spark people’s imaginations, your guests aren’t going to be as excited for you and thus may be less inclined to give to your honeymoon fund. One of my favorite parts about having a honeymoon fund was talking with our friends and family about our upcoming trip, a welcome reprieve from nonstop wedding questions. I strongly suspect we would have gotten way less questions about monkey hot springs and traditional Japanese tea ceremonies had we not selected vibrant engaging photos to go with our registry items. Beyond the no-image issue, the free version of Honeyfund has ads on your site. While I’m 100% on board with honeymoon registries, I can understand people’s concerns that certain sites may be scammy or nonsecure. You know what 100% makes something look more scammy? Crappy banner advertisements. Hard pass. Screenshots of our abandoned Honeyfund account. In hindsight, we paid more in processing fees with Wanderable than we would have for a splashy, ad-free site on Honeyfund and we probably should have more heavily weighed the pros and cons of signing up for a premium Honeyfund account (around $80). However, when you’re in the midst of wedding planning and literally hemorrhaging money out of every orifice of your being, there is nothing that sounds less appealing than paying $80 for your own wedding registry. It’s the principal of the thing, Honeyfund. I think we probably would’ve stayed with Wanderable, given my first point listed above, but without the myopic lens of “MY WEDDING IS MAKING ME A PAUPER AND I SHOULDN’T HAVE TO PAY TO HAVE A REGISTRY SITE”, I think it would’ve been a much closer call between Honeyfund and Wanderable for us. Generally, our experience with Wanderable and using a honeymoon registry in general was pretty great, but like any experience, had a few drawbacks. Hotel Gracery, probably the only four star hotel in the world with a Godzilla head emerging from its roof, almost made our registry, but we instead decided to save by staying at an AirBnB and just stopping by to see Godzilla in all his glory. It forced us to research and build an itinerary that both us and our guests were excited about. Because Wanderable did not have any affiliate experiences that were really appropriate for our trip to Tokyo, Hakone, and Kyoto, we had to custom create and populate our registry ourselves, which involved a ton of research figuring out where we wanted to go, do, stay, eat, etc. and how much those things would cost. Because we wanted our registry set up several months before our wedding, this forced us to research and to preemptively build an itinerary of the experiences that were the most exciting and important to us, with the supplemental perspective of value-add for our guests (i.e. if I don’t feel comfortable asking my grandmother to pay for a private chartered helicopter ride over Tokyo, how much value does the experience really have to us?). This really helped keep a lot of my unnecessary wants in check- for example, one of the ways Justin and I keep costs way down when we travel is by staying in some of the cheapest AirBnBs we can find in whatever area we’re headed to. For our honeymoon, I thought it might be sort of novel to stay in a hotel- some of the options we considered were Hotel Gracery, a Godzilla themed hotel in Shinjuku; the Hello Kitty Room in Keio Plaza Hotel; or a stay at the Park Hyatt Hotel, the swanky accommodations made famous as the setting of Sophia Coppola’s “Lost in Translation”. Once we started to price this out, though, and considered how expensive some of these hotel stays were as opposed to the other experiences on our wishlist (and how this might look to our guests), it became clearly evident that blowing that kind of cash (in some cases $400 a night!) wasn’t really worth it for an “experience” which pretty much amounted to a place where we remain unconscious for seven or so hours. Having this additional perspective really helped streamline our decision-making of what was worth the money. Because our honeymoon was fully funded by our guests, it helped me get more comfortable with the concept of investing in certain more upscale experiences. While I have had reasonably decent jobs since graduating from school, I had spent the majority of the years preceding our wedding scrupulously saving as much as possible, so we could afford the wedding of our dreams. This pretty much eradicated all opportunities for international travel and reduced most of our trips to budget-friendly road trips around the Midwestern United States. These habits, both from a saving and traveling perspective, have permanently shifted my viewpoint such that it feels downright wrong for me to spend money on a slightly more upscale or luxurious experience. Spa day? Hell no- that’s what yoga is for. Unique experience that is coupled with a uniquely high price tag? Unless I can find a Groupon for it, I’m most likely going to skip it for a cheaper option. Because of this mindset, I know I’ve missed out on some valuable opportunities in the past; some things that spring to mind are seeing a Broadway show, skydiving, and dining at Michelin starred restaurants. For our honeymoon, however, with the wedding finally being over and fully paid for and our honeymoon 100% being fully funded as a wedding present from our guests, it was helped me break free a little bit from this vantage point. While we still traveled in a budget-conscious manner (i.e. we walked or took public transit almost everywhere, ate at convenience stores for breakfast, and stayed at AirBnBs), we said yes to many more costly experiences that we may not have but for our honeymoon registry, which in and of itself was a wonderful and liberating experience. If you generally live your life in a responsible, financially-conscientious manner, why shouldn’t you splurge a little bit when you’re on the other side of the world? Order that outlandishly expensive cocktail at the rooftop bar, pay a little (or a lot) extra for a private tour, or spring for a massage- our honeymoon registry reset my viewpoint that sometimes treating yourself isn’t necessarily a wasteful activity. And having our honeymoon registry has actually changed my financial habits with respect to traveling- from now on, I’ve created separate pools of savings for our bigger trips so that we can travel and spend money on experiences, without freaking out about how a particular dinner costs as much as our monthly electric bill. In a way, it feels like your guests are participating in your honeymoon, which encourages thoughtfully taking and sharing photos and your experiences. In the months preceding our wedding, it was great when friends and family would navigate to our honeymoon registry and start conversations about specific activities or experiences they thought were interesting; I strongly suspect most guests do not express as much enthusiasm in Vitamixes from a standard wedding registry. Because our guests gave us the gift of experiences during our honeymoon, they were interested and invested in how the ultimate honeymoon turned out. After our wedding, we had a month before our honeymoon started, where I went through some pretty gnarly post-wedding blues. One bright spot for me was planning the honeymoon and talking about our Japan plans with friends. When it finally was time for the honeymoon, so many people had asked us to take and share photos of our trip that I was hyper conscious to document everything and post a couple times a day on Facebook and Instagram (which is about one hundred times more than I usually would). Not only was it fun to share and interact with friends and family back home throughout our trip, we also got random tips and recommendations via our social media posts (both from friends and random Internet folks) that we wouldn’t have discovered otherwise. The experience of planning, discussing, photographing, and evaluating our trip was so much fun, in fact, that I wanted to replicate the experience on our future trips- which essentially was the seedling idea for this very blog! Besides the obvious drawback that any honeymoon registry is going to withdraw a certain monetary percentage of your gifts, there are some other issues to consider. The lack of transparency around how the honeymoon registry works can lead to some uncomfortable conversations. In the weeks preceding the wedding, several friends would initiate conversations with me by exclaiming “I just bought you guys [insert random experience in Japan here], but it didn’t ask for your email or mailing address! Are the tickets/reservations being emailed or mailed to you or how am I sure they reach you before you guys go?” I would then have to explain to them that the site itself doesn’t purchase tickets or book anything; instead, the money is transferred directly into our account and we are expected to book everything ourselves. I don’t think anyone felt “duped” necessarily, but the lack of transparency around how the gifts eventually made their way to us made me feel slightly uncomfortable. I suppose there are probably ways you can make this explicitly clearer on your registry, but given the little attention our wedding website was given, I find it somewhat unlikely this would have significantly illuminated the arrangement to any guests. Once a guest buys you a certain experience, it can feel a bit like you’re “locked in” to actually scheduling that activity in your trip. In my Tokyo and Kyoto posts, I’ve referenced certain things I thought we could or would do during our trip, but ultimately changed our minds- for example, once we realized what was involved with owl cafes, we wanted nothing to do with it or nixing plans to go to snow monkey hot springs once we found out it was completely in the wrong direction. Unfortunately, these were things that we included on our registry and our guests explicitly purchased for us. While we wound up using these funds for things that weren’t initially on our registry but we really enjoyed (MariCar, for example), I again do not like the feeling that we were misleading or otherwise being untransparent with our guests. In a way, I suppose it’s fairly analogous to exchanging a physical gift you receive via a typical registry; however, because of the more personal, almost more intimate experience of the honeymoon registry, it felt a little bit off not strictly sticking to the experiences our guests had invested in. Because a lot of travel expenses are not necessarily static costs, it can be tricky, time-consuming, and a guessing game to create certain registry items. While certain activities clearly cost an identified amount of money (i.e. sumo wrestling tickets; a reservation for the Robot Restaurant, etc. ), a lot of travel expenses don’t necessarily have a set fee (think pretty much all dining costs, public transit, only-in-Japan style cocktails at Kawaii Monster Cafe). Therefore, a lot of our registry items was researching and making an educated guess as to how much certain meals or what the totality of an experience would cost (i.e. it costs ¥1,000 per person to take a tour of the Suntory Distillery, plus about ¥8,000 per person in public transit). While this kind of detailed research was really helpful in creating an itinerary and a budget for our trip, figuring this stuff out on such a granular level was a decent amount of work, not necessarily something you may have time for if you’re juggling a full time job, social/family/romantic life, and planning, coordinating, and making ALL the DIY things for your wedding. You certainly don’t have to do this level of research to make your honeymoon registry, but again, once you start making completely wild guesses about how much things will cost, you start running into the transparency issue and will have to figure out how you’re going to pay for any gaps between your guesstimations and reality, which brings me to the final and probably most important point. You cannot rely on your honeymoon registry funds to pay for your trip, so unless you can independently cover the trip (including any possible emergency expenses), a honeymoon registry is not for you. In researching this post, I read quite a bit of forum posts that went something like “we have zero dollars to fund our honeymoon and are thinking about preemptively putting our airfare on our credit cards, which we’ll pay off when the honeymoon registry funds hit our bank account. What do you guys think?” GUYS, THIS IS A TERRIBLE IDEA. First and foremost, this assumes that guests will fund your honeymoon registry. Despite what the wedding industry and our society has told you, people are not required to buy you wedding gifts and are certainly not obligated to buy you anything from your proposed registry. Going into our wedding, I knew this in the back of my mind, but was a bit surprised about how many guests didn’t give us anything and, to a lesser extent, sort of random (albeit kind, thoughtful, and cherished) physical gifts that we hadn’t asked for. When you’re hosting a wedding, the only thing you can possibly expect of your guests is to show up (and dance, guys, no one likes the dude in the corner who refuses to dance at weddings). My point is, you have no idea whether your honeymoon will be only partially funded by your guests or, like in our experience, completely funded! You cannot expect, rely, or anticipate that a single guest will give, out of their hard-earned money, you a single dime and thus, to the extent you cannot fully and comfortably cover the honeymoon on your own, this option may not be for you. As one of the added benefits of a honeymoon registry mentioned above, you will have a really good idea of how much your honeymoon will set you back after creating your registry experiences- so you don’t really even need to play too much of a guessing game of whether you can fit the trip in your budget. Has the wedding run you completely financially dry (I hear you, brotha)? My advice- sign up for a honeymoon registry, but hold off on actually implementing any plans (i.e. buying plane tickets, booking hotels) until after the wedding, when you can figure out if going on the honeymoon is financially feasible given how much your registry was funded and your personal financial situation. If your honeymoon to Tonga is still out of reach once the wedding is over, maybe consider revising your plans to a visit to one of the gorgeous U.S. National Parks or a nearby cool city you’ve been meaning to check out. As mentioned before, I’m super glad we had some time between our wedding and our honeymoon- it gave us some kind of time to recover from the emotional cyclone that is a wedding, gave us something to look forward to after falling off the Cliff o’ Wedding Expectations, and let us regain our physical energy so many late nights the weeks preceding our wedding; I’d highly advise giving yourself a month or so after your wedding before embarking on your honeymoon. Alternatively, you could make plans so long as they are fully refundable; however, I know this would be gut-wrenching for me to cancel tickets to a once-in-a-lifetime location because I was too broke from paying wedding vendors… in which case I may make a really dumb, inadvisable decision (like putting a honeymoon I can’t afford on our credit cards). All in all, I’m so happy we decided to do a honeymoon registry- it alleviated unnecessary clutter and waste in our household, afforded us the opportunity to have a once-in-a-lifetime trip, and completely reshaped the way I financially approached and evaluated our vacations.